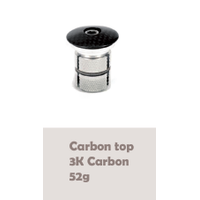 Minimum quantity for "Roxycle Carbon Fiber Headset Top Cap Expander" is 2. The Roxycle Carbon Fiber Headset Top Cap Expander is the ideal Accessory/Component for finishing off your carbon fiber or aluminum headset. At only 12g and made completely from carbon fiber the Roxycle Carbon Fiber Headset Top Cap Expander shall indeed put the finishing touch to any bike. Compatible with between 22mm~26mm diameter headset and it is quick and easy to attach to your steerer.